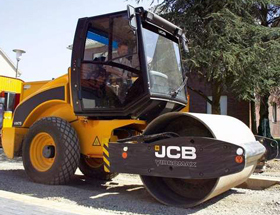 The vibrating roller JCB VM 75D / PD is a medium size compactor with a single roller. It is powerful and precise, and provides fast results and high quality. 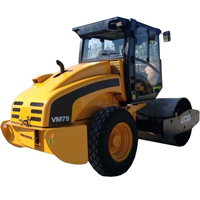 It weighs 7660 / 7320kg, its roller has a width of 1750mm and incorporates a JCB Diesel max engine of 4.4 liters and 63 / 156kW highly efficient (Tier 3) The VM 75D / PD roller compactor has been built to offer long-lasting performance. Thanks to this, its long useful life is guaranteed. This is an approach that we have adopted in all our compaction rollers and in all the complex components that we install to offer you greater performance and lower cost. As, for example, the one-piece eccentric shaft with anti-tip weights, which offers optimum performance with minimum maintenance. Infinitely variable hydrostatic direct drive by variable displacement motor on rear axle and drum, Multidisc self-locking differential (NoSPIN). Four-cylinder, water-cooled, four-stroke, turbo-charged diesel engine.